We dipped everyone's dishes into glaze. A lighter yellow glaze for most dishes as this would show most of the decoration we'd used more clearly. There was also a darker honey colour which looked lovely on Doug and Hannah's examples so we dipped a few in this glaze too. The unfired glaze is totally opaque and a pastel pink, almost the colour of plaster and so completely different to the fired effect. We painted a little wax resist on 4 corners of of the dishes before dipping them into the glaze. The wax repels the glaze. Little balls of clay are dotted onto the 4 corners, making little stilts. This stops the glaze on the base of the dish from fusing onto the kiln shelf. 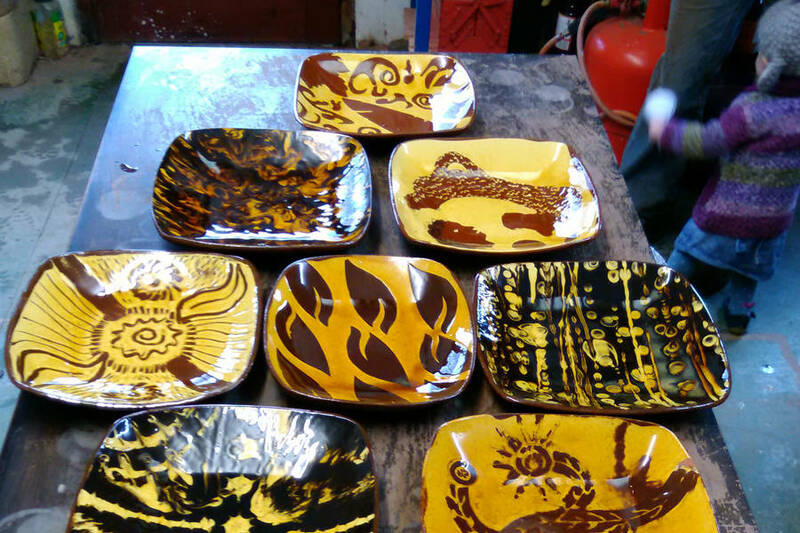 On our next day there, we unloaded the kiln and got to see the results. It's great to be able to analyse what techniques have worked best for us and what can be altered to make the next work better!